On the Monday, April 28, The Ed Show, MSNBC host Ed Schultz devoted the first segment of nearly 15 minutes of his show to trying to link prominent conservatives like Paul Ryan to the racist views of people like Cliven Bundy and Donald Sterling, whom the MSNBC host failed to label as a Democratic donor. Amidst the controversy surrounding Los Angeles Clippers owner Donald Sterling’s racist remarks, MSNBC’s Toure used the opportunity to conflate these comments with NBA owners who support conservative causes. Politico's David Nather must have thought he was so clever. Here's how he opened a recent column: "It can happen to anyone, right? You rally behind a guy ... and suddenly he’s spewing racist bile and boy, does it splash on your face." Yes, I left out a few words, and I'll get to that. 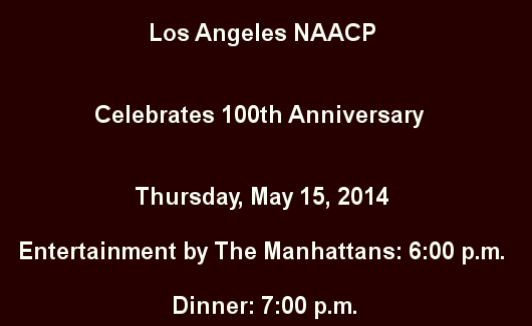 But before providing them, the quote just rendered would apply to how those at Los Angeles branch of the NAACP must feel about their now-withdrawn but not forgotten plan to confer a lifetime achievement award on Los Angeles Clippers' owner Donald Sterling, who has been caught on tape allegedly telling a woman that she shouldn't "associate with black people" or have blacks accompany her to Clippers games. Let's revise Nather's blather a bit for another comic circumstance: "It can happen to anyone, right? You rally behind a guy because he comes over to your side on climate change, and suddenly he’s arrested in 'a 20-count federal indictment that includes charges of mail fraud, wire fraud and tax fraud.' Boy, does it splash on your face." 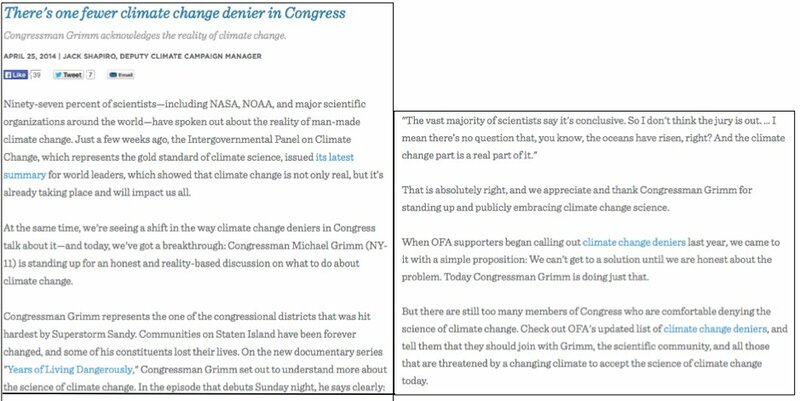 Now I'm talking about the fools at Organizing For Action, who celebrated the "breakthrough" of having GOP Congressman Michael Grimm come over to their side mere days before his indictment, which occurred today. Also on the Sunday morning program, left-wing activist and MSNBC host Al Sharpton quickly voiced his agreement with Gumbel: "I agree with Bryant, the NBA cannot be the endpoint. But it's got to be the beginning to say, 'We've got to deal with this.'" In a Saturday afternoon tweet, former Bill Clinton campaign strategist and former CNN talking head Paul Begala showed that he's quite a confused guy concerning Los Angeles Clippers' owner Donald Sterling. Sterling, as noted previously (here and here), has been caught on tape chiding a person who is apparently his girlfriend for "taking pictures with minorities" and "associating with black people." Sterling sees her as a "delicate" "Latina or white girl" who shouldn't "associate with black people." He asks her not to bring black people, including NBA legend Magic Johnson, to games. Last night (at NewsBusters; at BizzyBlog), I noted that Donald Sterling, owner of the National Basketball Association's Los Angeles Clippers, was allegedly caught on tape chiding a person who is apparently his girlfriend for "taking pictures with minorities" and "associating with black people." He also tells her that she is a "delicate" "Latina or white girl," and because of that doesn't understand why she would "associate with black people." He doesn't want her bringing black people, including NBA legend Magic Johnson, to games. In stunning audio posted at TMZ, Los Angeles Clippers' owner Donald Sterling chides a person who is apparently his girlfriend for "taking pictures with minorities" and "associating with black people." Sterling sees her as a "delicate" "Latina or white girl," and as such doesn't understand why she should "associate with black people." He doesn't want her bringing black people to games, including NBA legend Magic Johnson. Last month liberal media members armed with false allegations of racism went into a full-court press to prevent Rush Limbaugh from becoming an owner of the St. Louis Rams. On Tuesday, the owner of basketball's Los Angeles Clippers settled a multi-million dollar discrimination lawsuit wherein it was alleged that he had for years tried to keep blacks and hispanics out of his apartment buildings. This is actually the second such suit Donald Sterling has settled in the past four years. Despite this, America's television news media, which had a field day going after Limbaugh last month, completely ignored the story.